Give your child the gift of an amazing experience, and let us plan their next birthday party! Coming up with all the right things can be stressful, but no worries – this year you will leave that to us! Your child and their friends will enjoy all things fun at the farm – goats, chickens, sheep, farm dogs and even a llama! We’ll even provide the animal feed. They can participate in our farm themed games, as well as get a snapshot taken in our farm photo booth. This will definitely be one for the scrap book! Our pavilion is outfitted with lights, ceiling fans, and plenty of electrical outlets. You bring the guests and we’ll provide the clean-up crew! Choose from one of our 3 party packages, and add on our farm-themed goody bags to reduce your stress even more! All prices INCLUDE tax… No surprises – except the ones you plan! and leave the mess to us! or worrying that you might forget something. We’ve got you covered with the perfect farm party supplies! Want to really reduce your party stress? Let us arrange the meal, too! Just bring the cake & gifts, and we’ll handle the rest! Don’t worry about finding and assembling great goody bags for your guests. We’ve done the research and found great farm-themed goody bags and treats. You’ll love the convenience; the kids will love their new treats! Email us or call (423) 869-8927 to reserve your party! We require a $100 deposit to reserve your time. If we cater your party, we require a $200 deposit. The balance is due at the start of your party. A minimum of 10 days’ notice of cancellation prior to party date is required to receive a refund. If we cater your party, we need the final head count at least 5 days prior to the party date. We do not charge for infants. Once they start walking they count as a guest. The party area is under a pavilion so the party can go on even if it rains. Rain dates cannot be given at the time of booking, but we will do our best to reschedule your party within 2 weeks of the original date. If we cannot reschedule your party, we will refund your deposit. We will watch the weather forecast and contact you at least 2 days prior to your party if it looks like we may need to reschedule. You are welcome to contact us anytime if you have concerns about the weather (or anything else related to your party). You will be greeted by a hostess who is assigned to assist your party. She is not a babysitter; it is up to you and the adults attending your party to watch the children. You are welcome to come 15 minutes early to decorate your party area. If you purchased one of our “Simplify” packages, table cloths will be on the tables and your food table will be prepped with plates, napkins, etc. Catered meals will be served promptly 15 minutes after the party start time. Please use the last 15 minutes of your party to pack up your belongings (while the children play games and interact with the animals) so our staff can immediately begin to prepare for the next party. We understand that some people drive far enough to get here that it is not feasible to drop off their children and return home until it’s time to pick up their children from the party. We have a flyer available to give them with suggested things to do in this area, and we will include this information in your confirmation email in case you want to include it in your invitations. Silly string, confetti, piñatas, streamers, shredded stuffing, glass containers, whistles, and noise makers are prohibited as they can startle or pose a choking risk to our animals. Please do not tape, staple or nail decorations to any of our tables, buildings or trees. Balloons, centerpieces, free-standing decorations, and table decorations are encouraged. 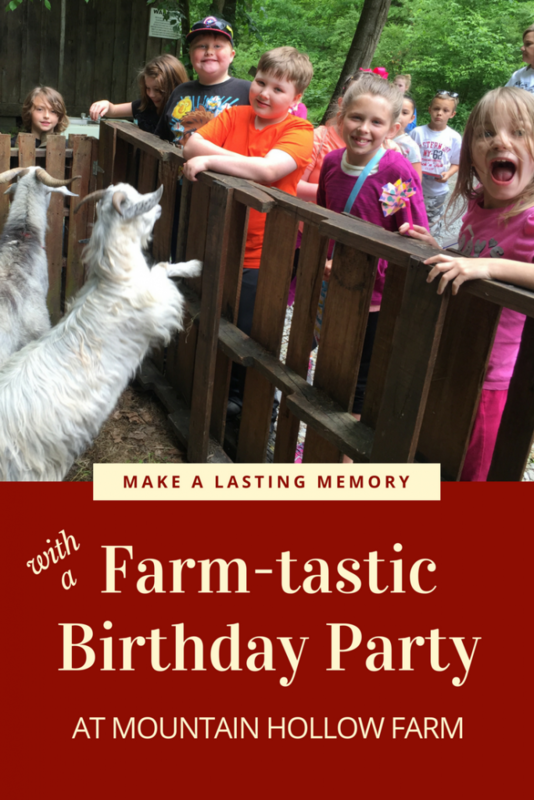 We supply a farm-themed birthday photo booth. No alcohol or smoking on the farm. We love dogs, but for the safety of our animals and guests, we do not permit pets on the property.